Explore the natural wonders of Taroko Gorge National Park with a private guide on this 2-day tour of Hualien County from Taipei. A private vehicle whisks you away from Taiwan’s capital along the eastern coastline before you embark on the Shakadang Trail, a flat riverside path through the stunning marble gorge. Discover the night market before an overnight at a countryside bed-and-breakfast, then stroll the seashore and visit a sugar factory and former logging village with your guide. Your itinerary includes two lunches featuring regional aboriginal cuisine. 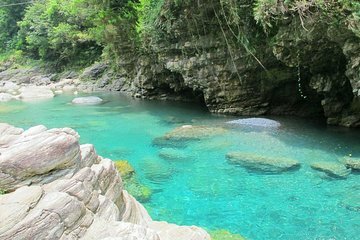 Spend two days exploring Hualien County with a knowledgeable private guide at your side. You’ll have the convenience of private transport and the undivided attention of your guide as you explore the natural landscapes of Taroko Gorge and the Niushan Huting seashore. In addition, visit cultural attractions such as the Hualien Sugar Factory and Lintian Shan Forestry Center. Stay overnight at Fanlin House Bed & Breakfast, located in a tranquil garden setting just outside of Hualien City. Relax in spacious rooms featuring fine-quality bedding, dark-wood décor and mosaic-tiled bathrooms with fitted tubs. Day 1: Taipei – Taroko Gorge National Park – HualienAfter hotel pickup in Taipei, you’ll be transferred to Taroko Gorge National Park where you’re greeted by your guide. After dropping your luggage off at the hotel, you're whisked away by private vehicle to a local restaurant specializing in aboriginal cuisine; your lunch includes dishes that utilize the mountain vegetables and fresh seafood of the region. Learn about the many aboriginal cultures that comprise nearly one third of Hualien County’s population. In the afternoon, take a drive to Taroko Gorge, an impressive 11-mile-long (19-km) marble canyon made of spectacular cliffs that stretch along the Liwu River. You can spend a few hours exploring the national park with your guide, learning about Taroko’s unique geography and the specialized flora and fauna of the region. If you’re feeling active, head out on the Shakadang Trail (formerly the Mysterious Valley Trail) for an easy hike along the edge of the winding river. After descending a stairway, follow the paved, flat path where you can observe picturesque rock folds in the river valley where insects, birds and butterflies abound. After approximately 2 miles (4 km) you’ll round a bend where a deep pool of clear water awaits — a perfect place to dip in for a swim (depending on the season). If you’re here during the spring, you’ll see tung trees in bloom, which enchant the trail with their snowflake-like blossoms. The remains of an old cabin, aka a 3D Cabin, mark the turnaround point of the Shakadang Trail for day hikers. Refresh after your hike with a shower and change of clothes at your hotel before a trip to Hualien’s Zhiqiang Night Market, where you’ll find plenty to satisfy your appetite (own expense). Try salty fried chicken, spring rolls, hot pot, Guangdong porridge, noodles, Japanese rice bowls, omelets or even pizza. You can wash down your meal with freshly squeezed juice, tea, coffee, grass jelly and other beverages on offer. Return to your accommodation in the early evening and relax at your leisure. Day 2: Hualien – Taipei (B)Enjoy a delicious breakfast at your accommodation before your guide picks you up for a full day of sightseeing. Your first one-hour stop is the Hualien Sugar Factory (or Guang Fu Sugar Factory). In addition to manufacturing granulated sugar for east Taiwan, the factory is a popular destination for its frozen products such as popsicles and ice cream. You can sample some treats during your factory tour before a visit to Lintian Shan Forestry Center. Learn about Lintian Mountain's lumber industry, which thrived until 1991 and included 400 to 500 households at its peak. Delve into the village's past as you examine remnants of the railway, freight transportation ropeway, and the few remaining staff dormitories constructed of Chinese cypress. Peruse the exhibition center for a glimpse at the once-thriving logging village, which included a grocery store, laundry, barbershop, fire department, elementary school and more. You’ll find an assortment of lumber tools as well as photographs and books on display. Around midday, enjoy a river-style lunch of regional specialties that utilize aboriginal cooking methods. In the afternoon, enjoy an approximate 40-minute drive south from Hualien City to a secluded spot in nature for a couple hours of free time. Niushan Huting, meaning Cow Mountain, is a private locale on Taiwan's east coast that was once used for cattle grazing. Relax with a book as you face the Pacific Ocean; enjoy a cup or coffee or tea in the café (own expense); take a leisurely stroll along the shoreline; or browse the open-art galleries in the garden featuring the indigenous-inspired wood sculptures. Later, your guide transfers you back to Taipei by private vehicle.